Chicago’s Disappears has been busy, busy. Three albums in three years: 2010’s Lux, 2011’s Guider and this year’s Pre Language. Disappears is admittedly not doing anything new. Their three albums reclaim late 60’s garage rock (the Velvet Underground aesthetic on Lux and the White Light, White Heat structure of Guider), early 70’s proto punk and Krautrock, late 70’s post punk (particularly The Fall and Wire) and early 90’s shoegaze. Their sound also incorporates elements of frontman Brian Case’s former band The Ponys. Pre Language wasn’t exactly what I expected for Disappears third release. Their debut, Lux, was a pared-down 10-pack of two and a half minute garage-gazers. Guider pushed the same fundamentals for the first half of the record (tracks 1-5) and then followed it up with the nigh-16-minute long “Revisiting” (as if Can were pedal-possessed). Pre Language returns to commercial safety by spit-polishing what was appealing about Lux. “Commercial” is not to be taken pejoratively here; I am totally fine with bands wanting to gain popularity and/or make money. Pre Language is by no means a sell-out record and Disappears absolutely maintain their musical integrity; however, it is a bit of a creative head-scratcher. If you got a little bit “out there” and people liked it, why stop? You’re on Kranky Records for heaven’s sake. While touring for Guider, original drummer Graeme Gibson left the band and was replaced by Sonic Youth’s Steve Shelley. Pre Language is the first album recorded with Shelley on drums which must have been an exciting prospect as the band lists Sonic Youth as one of their biggest influences. Who doesn’t these days? Shelly adds a thumping percussive backbone to the wavering distortion of the guitars. Brian Case still channels the vocal styling of Iggy Pop, but more obviously Mark E. Smith on Pre Language, falling somewhere between the grimy energy of Fun House and the last-syllable-accentuated speak-singing on Hex Enduction Hour. 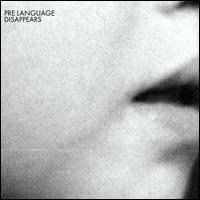 Disappears’ Pre Language, like its predecessors, is a very listenable album; but, like its predecessors, it falls short of something great. They must realize that they have most everything they need to make a Dagwood of a post punk sandwich. Disappears just needs a few slices of fresh bread and some special sauce. Tracks That Piss Me Off: “Love Drug” – “Revisiting” is nearly three times the length and yet it feels like a quicker listen.